There was a time when we didn't. Between the Tabletop episode and all the other nice things people were saying on the Internet about the game, we couldn't keep Zombie Dice in stock. Many of you weren't able to get the game when you wanted it, and that's largely because we underestimated demand. Zombie Dice 2: Double Feature is a different story. Or maybe the same story. We ran into the same problem there that we did with the original; you'd think we'd have learned our lesson, but apparently everyone wants Zombie Dice and its associated expansions. At any rate, Double Feature will be back in stock in May, at which point you can get your greedy, undead little hands on it. We're hoping to avoid all this going out-of-print nonsense with Zombie Dice 3: School Bus. 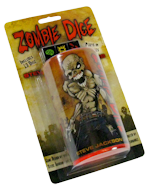 We all saw how popular Zombie Dice was. We're currently seeing how popular Double Feature is. Fool us twice, shame on us. We want to make sure anyone who wants School Bus can get it, and we're going to work hard to make sure that happens. In the meantime, you can satisfy your need for sweet, sweet brains with things like score pads, brain cases, and Zombie Dice Deluxe, which has those things bundled into the game! There's also an app!